I left Laguna Beach this morning heading home after a wonderful break from routine. I had only travelled about 15 miles, when the traffic really starting piling up…bumper to bumper…in the pouring, blowing rain! When it cleared enough for me to see, it looked, for all the world, like a house, with a smoke stack was at the head of the line. When the wind died down a little I could see that the little house seemed to be sitting in a big pickup truck! And, honestly…I thought there looked like someone standing outside the house with his hand up…WAVING! Traffic crept along all the way to Bonifay! In reality, only about 30 miles or so, but it felt like 100! Part of the area I was driving in is under construction and the the lanes kept shifting from one side to the other. Two lanes…under construction, weaving back and forth to change roads, rain, wind and tired me. Not the best combination! Then someone, whose name I won’t share, called me on my car phone and to tell me to “quit poking along! You gotta pass those cars and go!” 🙂 But that was before she saw the house driving 7 cars in front of us! Surely she couldn’t expect me to pass a house! Now why in the world does a person driving something like that not realize there is a line of traffic behind him and pull off the road every 8 or 10 miles to allow other to pass by? Would that be so hard? Why, of course not! Finally the driver pulled off the road at a flea market type place, and as I passed by I saw that it was a PIG, wearing a hat, waving to me from the back. Written on the side of the house was a big sign that said, SMOKIN’ BUTTS BARBECUE’. It was one of those vendors that set up at fairs and carnivals. I had to laugh at the sight of it all! As I drove on home, still in bad weather, but at least very little traffic, I realized a few things. I was leaving my little cottage at the beach, where I had enjoyed a marvelous week. Suzanne and Adam and Levi were there part of the time…and then someone near and dear to me came and spent a day or two. (If I told you her name, you’d know who was nagging me!) I ate at some great restaurants and shopped and played and talked and laughed and slept late…it was a wonderful vacation. Why should I let this PIG HOUSE steal my joy? Well I shouldn’t. I have been singing a little song to Levi lately that says, “Be patient…Be patient….Don’t be in such a hurry!….When you get…Impatient….You only start to worry…..Remember….Remember…That God is patient, too….And, think of all the times when others have. to. wait. on. you!” Well! I should practice what I preach, huh? And, then I remembered something I learned a long time ago. God is in control of my life…and I truly believe He is! Thank Goodness! So, if I am delayed or detoured or slowed down…it is because I NEED to be delayed or detoured or slowed down! I know that! I just forgot for a little bit. He has a plan for me and it is to bring good things to me. So, if He needs to ‘slow me down’…that’s fine with me. The Bible reads in Romans 12:12…..”Rejoice in hope, be patient in tribulation, be constant in prayer.” That Pig House was my ‘tribulation’ today….but, I failed the patience test. I thanked Him for slowing me down. And opening my eyes…and my mind. 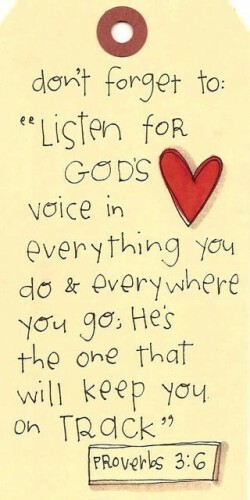 And for protecting me and guiding me, even when I get annoyed at my circumstances and forget that He is in control. Oh! How clear and in focus our hindsight!